Way back, almost a year ago now, I created this area in my back entrance for my boys. If you've been reading my blog for a while now, you may remember seeing this area. 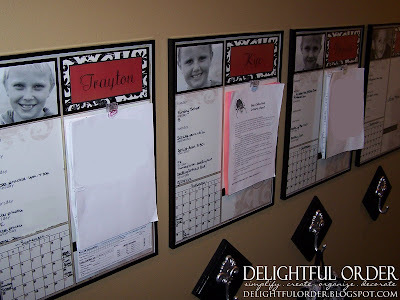 It's the post titled Homework Bulletin Boards. #1 - My boys come home with classroom newsletters each week, which are 8 1/2 x 11 paper size. On the old bulletin boards, I had to fold the newsletters in half, which I didn't like. 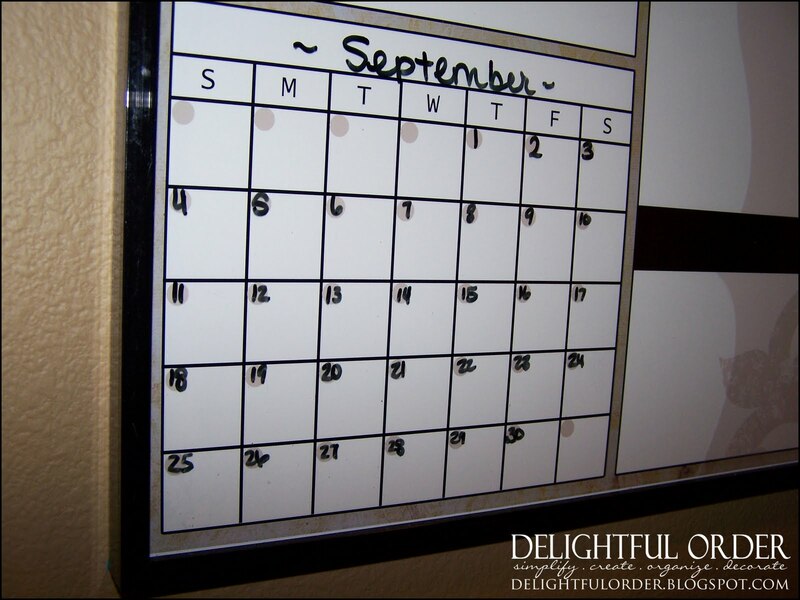 #2 - I had printed out little mini-calendars to track their months. I did this for about 2 months and that's about it. 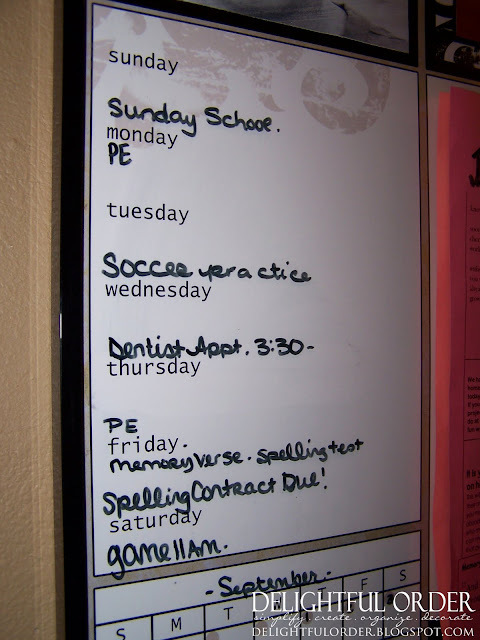 #3 - There was NO place to track their weekly schedule, WHICH is very important for me AND for them. #4 - When I first created this section in my back entrance, I only made 3 bulletin boards. I didn't make one for my littlest guy AND he actually has appointments too & eventually will be going to school, so I wanted a board for him as well. #5 - I wanted to create something that I could have available in my Shop. I designed and printed the 16 x 20 Child Message Center and framed them in $3.00 frames from Craft Warehouse and use them as a dry erase boards writing directly on the glass with my dry or wet erase marker. Go here to see how I made the backpack holders. The Child Message Centers are available HERE. 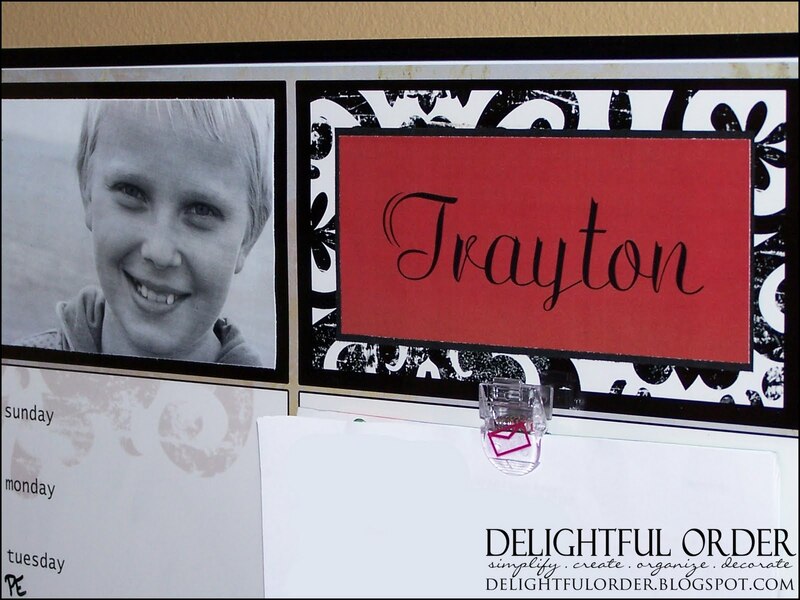 After printing your piece, simply glue a 4 x 6 photo to the print and if you'd like to customize it a little more, you can either PRINT your child's name or initial onto colorful cardstock paper and glue that to the top right box. If you have a Cricut machine, cutting the letters of their names would work great too. What's really cool about this piece is that you can change the photo and the name box area as often as desired, giving a new look, which means that you can use this print over and over again for years to come. I customized my boys' prints with a recent photo of each of them and their names. After placing the print into the frame, I simply hot-glued clips to the glass to hold their weekly school newsletters, important papers and homework. and so far, it's been working well. I use a wet erase marker to write directly onto the glass. 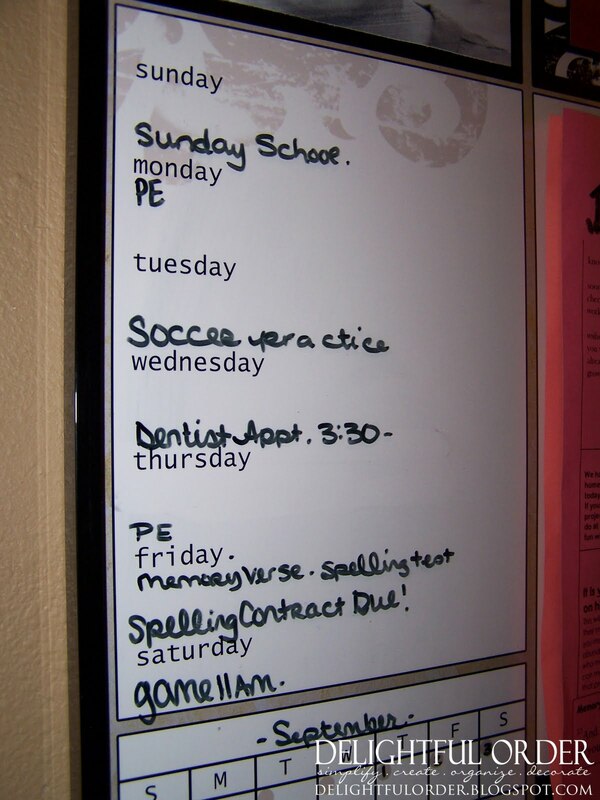 Homework due dates, tests and any other important information is written on their boards. PE days are now marked on the day of the week, giving no reason that PE clothes should be forgotten at home. Soccer schedules for 3 boys can get crazy busy too, from practices to games to where and when. There is absolutely NO way I can remember it all. NOW it's all written on their boards. 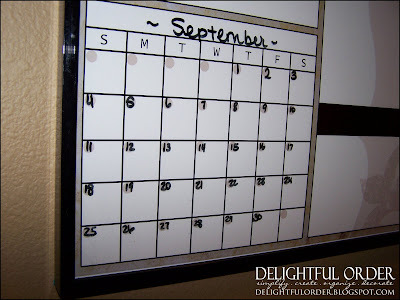 There's a small monthly calendar too! I Love. Love. Love. this area NOW! It's really been working GREAT! 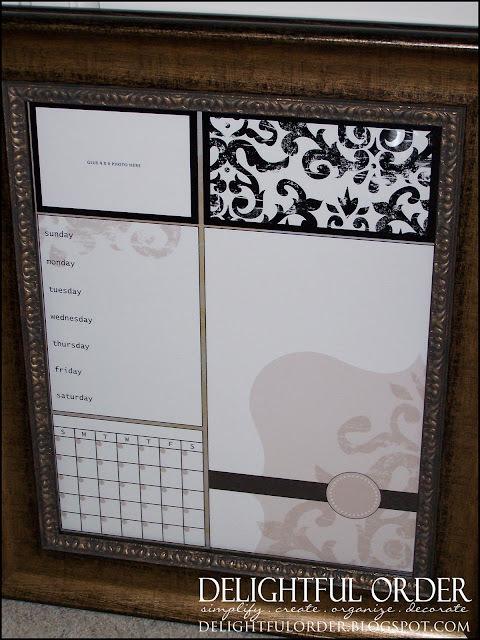 I'm super excited to be offering more Message Center Prints in digital format for a fully organized home. Keep checking the shop to see all available pieces. Great idea. I just need to find a place in my house to do this. 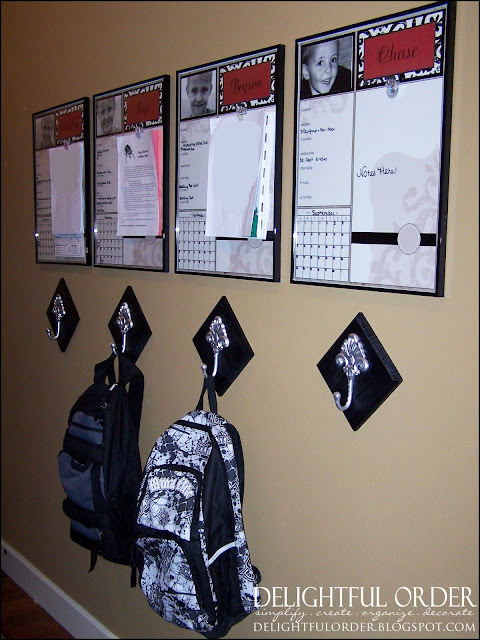 I'm thinking I will add bins under instead of the hooks since we home school. What a great idea. I love the pictures at the top and little clips for papers. VERY ORGANIZED AND VERY CUTE!!!! Love this!! They look so chic too! You are a genius! I need a more creative brain. I never thought to use an regular frame as a dry-erase. Duh. I'm sure that's old news but I am astonished! These are a great idea! I wish I would have thought about this when my kids were younger. They were little long before blogging. If they were young now I'd have the coolest organizing and party ideas thanks to all the talented bloggers sharing these great ideas! Fabulous idea! Love how it keeps everything organized and in one place. 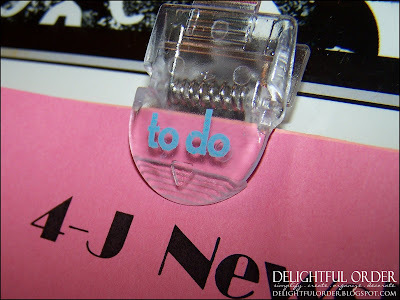 Awesome ideas DaNita...Why didn't I think of that when my kids were all in school? Love, love, love it! Will be suggesting this to young mothers! You are amazing! Love this post...and your blog! This is a genius idea! I ran out and got some 40 by 40 click frames and made up 3 frames for mine. WE all love it. Thank you. It's so nice to have a place for the paper. We have a hwk station with supplies and resources but no where to put paper so this is just perfect. I love the idea of being organised but seeing it in action is cool! Love it!! Moving into a new house soon, and I have the perfect place in mind for these. 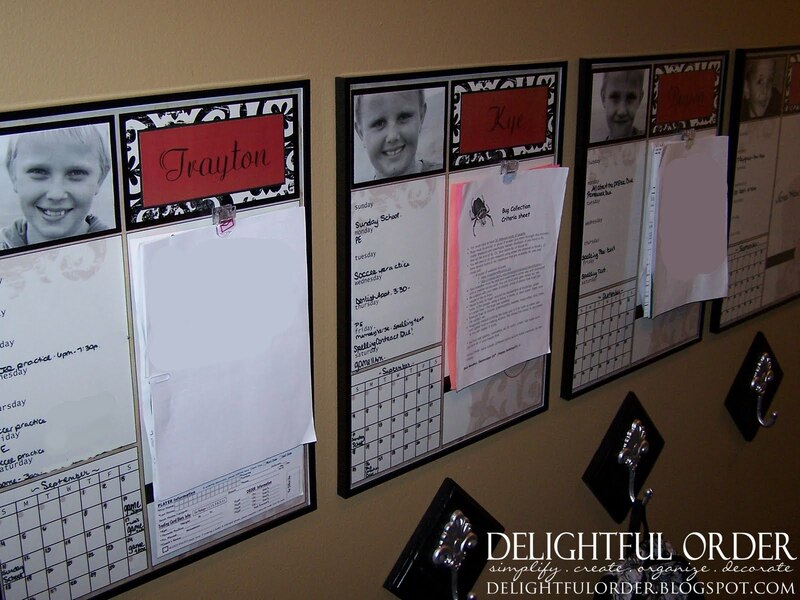 this is a very great idea to be organized! I sometimes forget stuff that's written on my notebook organizer, so this one will be a good help especially for home makers. thanks for the inspiration! DaNita..these are adorable! Have anything like that for adults to use in a home office? 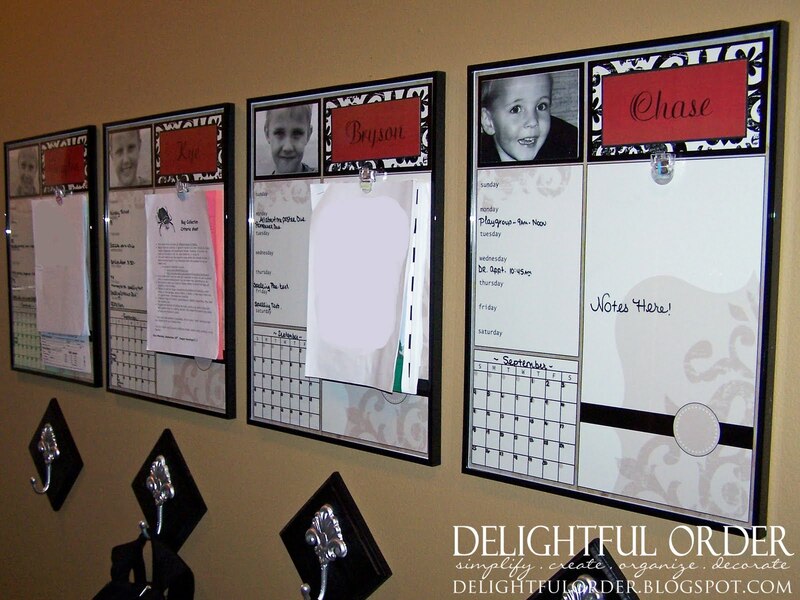 Have you ever taken an old picture frame and made a bullentin board for the office? Trying to find instructions how to do it and where to buy the bullentin board material, or is it just as economical to buy the finished bullentin board from an office supply store? Can I ask where you found the frames? I'm almost scared to go look how much it will be for five 16x20 frames sturdy enough to go through daily writing and clipping! LOVE this idea, though! 2 of my 4 are teenagers, and there schedules are insane! I can't wait to put this idea into action! Thanks for sharing! 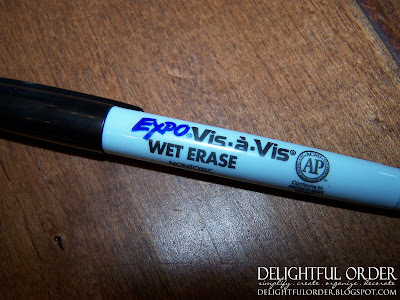 I use a wet erase marker(because I don't want it to wipe off easily.) and I've been keeping the marker on top of the picture frame. I haven't used a dry eraser. To remove the wet erase marker, I use a glass cleaner and paper towel. 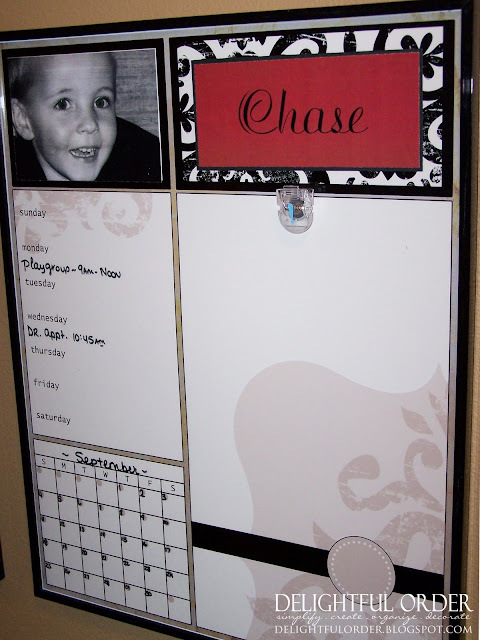 You could get a dry erase marker with an eraser on the end and simply store the marker on top of your picture frame. I love this idea!!!!! I have three kids going on four so this will work great for me. I'd love to have all my sixth grade parents adopt this system in their homes! What a wonderful idea! I'm storing it away for when my kiddos are all in school! Thanks so much for sharing! i love the idea, but i often lose track of information i receive more than a montg in advance, like field trips, sports picture days, etc. how do you keep track of all of thoae random things that dont quite fit in here, but come home with the boys? Either I write it in the notes section at the bottom of their boards, or attach the paperwork onto the clip. Very cool idea! 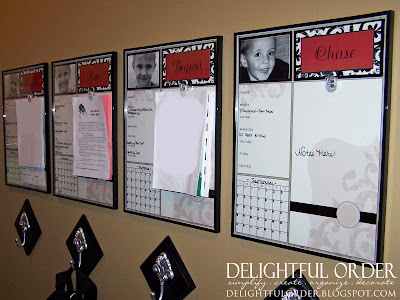 I'm needing a better organization system for my kiddos and this sounds great. Thanks for sharing! Where did you find the frame? Is it real glass or plexiglass? Thanks! It is real glass. My frames are from Craft Warehouse. Thanks, I love this! Just trying to find a frame that doesn't cost and arm and leg. Don't have craft warehouse here. You are welcome to post the give-away on your blog. Just email me at nrmetzler@windstream.net and I will send you the HTML. 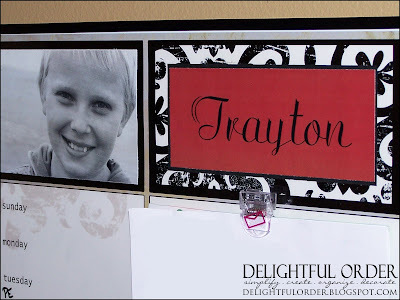 quick question about the clip you added to the frames...i made similar boards for my kids awhile back and tried to attach a clip to the outside of the glass frame (i think the exact same ones you have!) 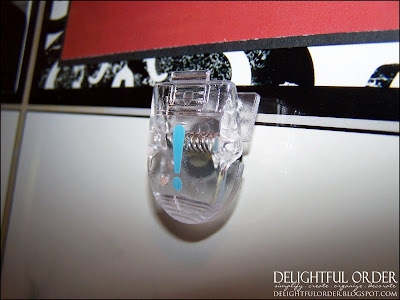 but could NOT get the clip to stay with hot glue--the magnet simply doesn't adhere. i'm trying the process again and am using an epoxy type glue...fingers crossed. how did you get your clips to adhere so well to the glass?? thanks! I had no problems getting the clips to attach with a hot glue gun. Make sure the glue is heated well and hot enough. Very cool idea...will make some for my children. I found you on pinterest ... And have plans to start some projects you show on the page, starting from this one ... I just bougth the frame and im super exited to start it. Reading you from Costa Rica. Thank you for all the great ideas!!! Did you ever post anything on making the backpack holders? They're so cute!